Learn how dietitian can get families to break bread together so they can enjoy a plethora of health benefits. Americans love the family meal. At least they love the idea of breaking bread with loved ones and enjoying one another's company. After all, the family meal serves as a time for light banter, teachable moments, laughter, and just plain old catching up. The trouble is, many families just don't seem to be able to eat together as often as they wish. Dietitians, however, can help empower parents and other family members to overcome obstacles to sharing mealtime. How often do families eat together? According to David Emerson Feit, vice president of The Hartman Group, a research firm that conducts both survey research and in-depth interviews to understand family meals, statistics vary depending on the definition of a family meal. Considering a family meal is one that's eaten at home with food prepared at home and with other family members, about 50% of dinners in households with children are family dinners. Roughly one-third of breakfasts and one-quarter of lunches meet these criteria. Parents prefer to eat home-prepared meals with their children. "More than two-thirds of parents say they want to eat with their kids every night if they could," Feit says. Parents say that eating together is more enjoyable and satisfying, a better value than eating alone, and an important opportunity to strengthen family bonds and social development. In addition, nearly 88% of adults say that home-prepped meals are more healthful than meals eaten outside the home, Feit adds. In general, parents have several goals when they eat shared meals. One goal is for the food to be healthful. "Parents feel especially good about meeting that goal because it's part of taking care of people. Meeting everyone's individual tastes or needs is another level of success," Feit says. Social connection and quality time also are important goals of family meals. Parents struggle to meet all of these goals, so they often compromise on the foods' healthfulness. "Sometimes it's easier without healthful food," he explains. Even when families eat together, they may not eat the same foods. About 20% of parents with preteens or school-aged children say they regularly provide a separate dinner for them. And about one-third of multiperson homes don't share the same main dish. Among homes with millennials, the tendency to prepare different foods is even greater. Evidence links shared meals with several positive outcomes for family members. It's difficult, however, to infer causal relationships. It may be that parents who implement family meals have greater resources or that families who dine together engage in other behaviors that lead to markers of better health and overall well-being. In addition, research results vary based on the definition of a family meal, the type of research conducted, and the population studied. When it comes to weight, there are gender and racial differences. A review of 17 studies found that youth who ate at least three family meals per week were about 12% less likely to be overweight than their peers who ate family meals less frequently.2 The data may not apply to all populations, such as African American girls.1 Among parents in general, eating with their children is associated with lower BMI status. Among fathers, eating family meals at home is associated with lower BMI, but eating with their families outside the home is associated with higher BMI. According to The National Center on Addiction and Substance Abuse at Columbia University, children who have frequent dinners with their parents are less likely to drink alcohol, smoke, or use drugs. "Parental engagement fostered around the dinner table is one of the most potent tools to help parents raise healthy, drug-free children," the organization's report states.3 Compared with teens who have dinner with their parents at least five times per week, teens who have less than three family dinners per week are 350% more likely to say it's OK for teens their age to get drunk. The same research group at Columbia University found that teens who dine with their parents regularly are 150% more likely to report having a better relationship with each parent compared with teens who eat dinner with their parents infrequently. While there are many health benefits to eating frequently with family members, many families find this difficult to achieve. Parents don't need convincing. They already value the family meal. Yet they tend to be overwhelmed in their efforts and want solutions to common obstacles. According to Feit and the research of The Hartman Group, the obstacles to family meals are similar to the obstacles of eating at home, in general: It takes effort and planning. There's the question of whether the food in the home, especially the fresh items, matches the aspiration for the meal and whether one or more family members has the necessary combination of motivation and energy to bring the meal together, he explains. Other hurdles include lack of ideas and a sense that a satisfying, healthful meal is too expensive. Millennials, in particular, expect ongoing variety and last-minute planning. Yet weekly planning is more conducive to healthful and structured eating. In addition, according to Paige Marshall, brand manager at Bush Brothers and Company, their company-sponsored research suggests that millennials prefer cooking without recipes. "What's really distinctive about family meals," Feit says, "is the fact that even if you can overcome all those problems, the more widespread, greater difficulty is getting everyone together at the same time around a common meal solution." Having irregular and conflicting schedules is the most cited obstacle to family meals. Unfortunately, conflicting schedules is ingrained in our culture. Family members arrive home at different times because of varied work schedules and after-school activities for kids. With expanded gender roles, moms have more opportunity to work outside the home, but families struggle with shared meal planning and preparation, with most of the work still left to the mom. Different food preferences add to the burden. Busy schedules may take time from meal planning and preparation, but the bigger hurdle is lack of energy to overcome the common obstacles such as getting everyone around the table at the same time and planning a satisfying meal. "We understand that it's more about the energy, including the mental energy of figuring out what to prepare, for who and when, and when that's too hard, how to fill in using prepared food or take-out," Feit says. With some creativity, wise use of time, and realistic expectations, parents can enjoy more family meals, says Liz Weiss, MS, RDN, host of the Liz's Healthy Table podcast and blog. The following are dietitians' solutions to many of the common obstacles to family meals. • Time is short. Drop the notion that everything has to be perfect or made from scratch, Weiss says. Instead, look to shortcut ingredients such as canned beans, canned and frozen vegetables, ready-to-heat cooked grains, and spiralized vegetables. Stacy Lewis, MS, RDN, from Mobile, Alabama, says that picking up a rotisserie chicken or other prepared food at the supermarket is a quick way to a wholesome meal. Sarah Pflugradt, MS, RDN, LDN, recommends keeping a list of last-minute suppers. These are meals that you've discovered your family enjoys and can be made from ingredients on hand in less than 20 minutes. Weiss also suggests leaning on time-saving appliances. Clients can prepare a meal or a single dish in a slow cooker early in the day when they have time to prepare ingredients, and the food can be ready to serve when the family is ready to eat. The trendy new electric pressure cookers significantly decrease cooking times, so family members can turn on the heat shortly before dinnertime. Freezing leftovers or planning meals to store in the freezer is another timesaver, says nutrition communications consultant Tina Carlucci, RDN. Setting aside one day to meal prep for the week is a strategy many people find helpful. In their research, Bush Brothers found that millennials favored the cook once, eat thrice strategy. Dietitians can help patients find appropriate recipes for this strategy. For example, families can enjoy traditional chili one night and serve it over rice later in the week. • Minimal cooking skills. Jodi Danen, RDN, founder of the family nutrition site Create Kids Club, encourages parents to start with very basic recipes such as a baked spaghetti dish. They can choose additional skills-building recipes at their own pace. Joan Salge Blake, EdD, RDN, LD, FAND, a clinical associate professor at Boston University, suggests fortifying convenience foods with a dose of nutrition. For example, adding a can of rinsed black beans and a jar of salsa to a favorite macaroni and cheese dish boosts nutrition while taking little time and requiring few kitchen skills. In addition, dietitians can help clients find local cooking classes at community colleges and recreation centers. Carlucci reminds parents that not every meal needs to be Instagram worthy. • Lack of inspiration. A subscription-based menu planning site such as the dietitian-owned My Menu Pal offers full menus to alleviate the stress of deciding what to cook. Jenna Braddock, MSH, RDN, CSSD, LD/N, sports dietitian and blogger at MakeHealthyEasy.com and OffSeasonAthletes.com from St. Augustine, Florida, routinely solves the inspiration problem with meal delivery services. "They give me relief from having to plan and come up with an awesome dinner idea because I just choose from their recipe options," she says. Emily Abegglen, RDN, CD, a clinical dietitian at Bellin Memorial Hospital in Green Bay, Wisconsin, recommends clients try out favorite restaurant meals at home. One way to do this is to advise clients to search the internet for a healthful version of their favorite restaurant meal. Moreover, clients can expand favorite dishes or flavors to foods. For instance, if tacos are a family favorite, they also may enjoy taco flavors in different ways by making fish tacos or taco soup. • Different schedules. Weiss suggests thinking beyond the family dinner table. If kids have a sports event or another dinnertime activity, parents can pack a picnic dinner to eat before or after the event. When family members can't get together for dinner at the same time, Pflugradt recommends switching gears and enjoying family time at breakfast. • Various food preferences. 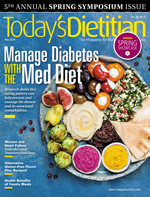 Jessica Levinson, MS, RDN, CDN, a New-York based culinary nutrition expert, recipe developer, and founder of Small Bites by Jessica, favors dinner buffets in which ingredients are offered in separate bowls. Family members can create a dish according to each person's preference. Everyone may be eating a Buddha bowl or pasta, for example, but each dish is individualized. Sharon Palmer, RDN, The Plant-Powered Dietitian and Today's Dietitian's nutrition editor, says her approach is to make a few different foods and serve them family style. The key is to make sure that everyone will enjoy something on the table. "The exposure to new foods always helped my kids gradually try new things," she says. Cheryl Mussatto, MS, RD, LD, a clinical dietitian and adjunct professor at Allen Community College in Burlingame, Kansas, encourages parents to give each family member a choice of what goes on the menu. • No meal planning skills. Begin with a blueprint for a balanced meal, says Diane Welland, MS, RD, a consultant and writer based in Washington, D.C. Plan for a protein-rich food like meat or beans and surround it with vegetables and a wholesome starch. Clients will soon find that they have a few favorite meals that work well for their family. Parents and other family members also want mealtime to be full of enjoyment. Weiss encourages parents to get creative and vary the eating experience. Parents can serve meals family style sometimes and serve meals restaurant-style with multiple courses other times. Kids can pick a theme night such as taco night or build-your-own pizza night. In conversation, parents can volunteer the best parts of their day and ask their children to do the same. Finally, Weiss suggests parents set clear boundaries for mealtime, but to do so in a playful way. For example, if cell phones aren't allowed at the table, each family member can put their phones into a decorated box identified as the cell phone jail. When the meal is over, the jail sentence ends. — Jill Weisenberger, MS, RDN, CDE, CHWC, FAND, is a freelance writer and a nutrition and diabetes consultant to the food industry. She has a private practice in Newport News, Virginia, and is the author of the bestseller Diabetes Weight Loss — Week by Week and the new Prediabetes: A Complete Guide. 1. Fulkerson JA, Larson N, Horning M, Neumark-Sztainer, D. A review of associations between family or shared meal frequency and dietary and weight status outcomes across the lifespan. J Nutr Educ Behav. 2014;46(1):2-19. 2. Hammons AJ, Fiese BH. Is frequency of shared family meals related to the nutritional health of children and adolescents? Pediatrics. 2011;127(6):e1565-e1574. 3. The National Center on Addiction and Substance Abuse at Columbia University. The Importance of Family Dinners V111: a CASAColumbia white paper. https://www.centeronaddiction.org/addiction-research/reports/importance-of-family-dinners-2012. Published September 2012. 4. Eisenberg ME, Olson RE, Neumark-Sztainer D, Story M, Bearinger LH. Correlations between family meals and psychosocial well-being among adolescents. Arch Pediatr Adolesc Med. 2004;158(8):792-796. 5. Neumark-Sztainer D, Wall M, Story M, Fulkerson JA. Are family meal patterns associated with disordered eating behaviors among adolescents? J Adolesc Health. 2004;35(5):350-359.